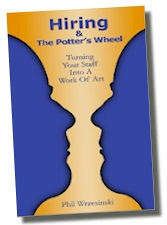 Another excerpt from the book "Hiring and the Potter's Wheel: Turning Your Staff Into a Work of Art"... Read previous excerpts here and here. Thursday arrived and Mary breezed into work. But even then, the minutes ticked off slowly as Mary anticipated her luncheon meeting. Finally, at 11:30, Mary grabbed her coat and headed out the door. It was only three blocks from her office to the deli. With the sun shining, Mary walked briskly down the street, her enthusiasm putting a bounce in each step. As Mary grabbed the door handle, she noticed Dr. Scott a half block away. Mary waited. “Thank you so much for meeting me. I am so grateful,” Mary blurted out. As Mary scanned the menu, she could see the tables beginning to fill up. They both ordered quickly, and settled in to wait for their meals. “As I recall,” Dr. Scott started, “you were always one with an open mind. No matter how many times I challenged you to do better, you did. So it was funny you would call the day you did. I was opening my mail when the phone rang and had just received an invitation to the best human resources training program ever. It’s in the evenings, right during my HR308 class. Believe me, this program would be perfect for you. It meets twice a week at the downtown YMCA and runs for five weeks. Dr. Scott slid a simple tri-fold brochure, black ink on white paper, over to Mary. Mary was confused. “The ‘best human resources training program’ came on a simple black and white brochure in a class down at the Y?” Mary thought to herself. Mary took the brochure from Dr. Scott and read the front of the flyer. Now Mary was even more confused. “Pottery?! Dr. Scott, this must be a mistake. I think you’ve given me the wrong brochure,” Mary said indignantly. Before Mary could respond, the waitress brought their food. And Mary could tell by the way Dr. Scott dug into his ham & Swiss that further discussion was out of the question. As Mary walked back to the office, she grappled with the idea of how taking a pottery class could teach her to find, hire and train twenty great sales reps. No answers came and even the sunshine could not force its way into her furrowed brow. “Pottery?” she continued to question. Buy your copy of the book here and transform your staff into the masterpiece you want them to be.